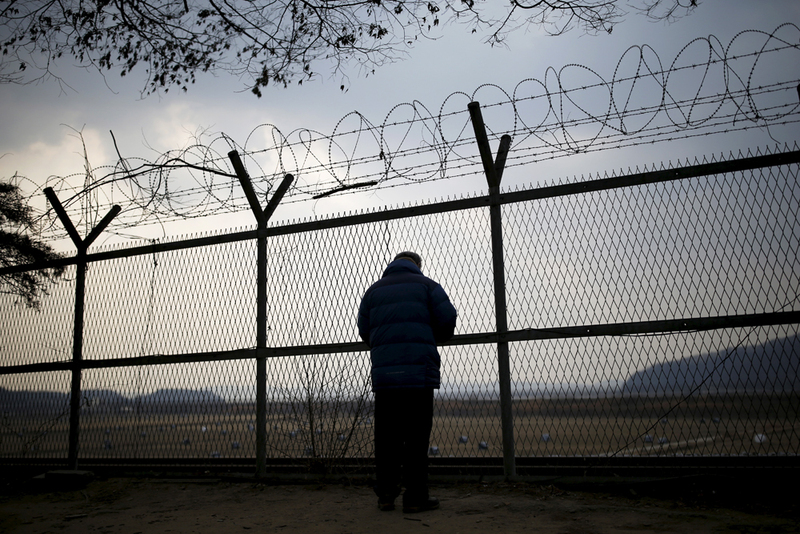 A man looks through a barbed wire fence near the demilitarized zone separating the two Koreas in Paju, South Korea, February 8, 2015. In the beginning of February, Russia and North Korea signed an agreement on the mutual repatriation of illegal immigrants. While a Russian deportee from North Korea does not face any risk at home, labor camps and the death penalty may await a North Korean in his country. After deportation proceedings were filed against him, North Korean citizen Kim, who has been in Russia since 2012, is left with just one option: apply to the Russian Federal Migration Service (FMS) for temporary asylum. Harsh punishment awaits Kim in his home country. Kim first fled from North Korea in 1997 to escape extreme poverty. The college where he had studied was closed and Kim, an orphan, was left out on the street. He first decided to flee to China, and was successful. He spent a decade in various regions of the country and then tried to move to Russia. But his old map betrayed him. Kim ended up crossing the China-Kazakhstan border. He was detained by the Kazakh authorities and extradited to North Korea, where he received a ten-year sentence in a labor camp. He managed to once again escape from North Korea in 2012. “This man shows an enormous will to live a better life,” says Svetlana Gannushkina, head of the Civic Assistance Committee. She is the only Russian human rights activist who helps North Korean refugees. “By improving diplomatic relations with North Korea, our government obviously does not intend to facilitate the process of granting asylum for North Koreans,” Gannushkina adds. Kim has been trying to receive political asylum with Gannushkina's help since 2012, but has not succeeded. The FMS says that there are no grounds to grant him asylum. His latest application was rejected just before the latest Russia-North Korea extradition agreement was signed. Intense media coverage of this case seems to have helped Kim’s cause. Sources told Kommersant that he was urgently called for an interview by the FMS and may receive temporary asylum this month. It will, however, be much more difficult for those escaping to Russia after February. According to FMS statistics, 68 North Korean citizens have received asylum in Russia since 2011. Just two of these people have been recognized as refugees. In comparison, 311 Afghan citizens have refugee status and another 656 have received temporary asylum. Ukrainians citizens are the largest recipients of temporary asylum and refugee status in Russia. Since the fall of the Viktor Yanukovych regime in Kiev and the start of the military conflict in eastern Ukraine, almost 300 people have been recognized as refugees and 400,000 received temporary asylum status. The FMS says that there are more than 20,000 North Korean citizens in Russia. This includes diplomats, students and laborers working in Siberia and the Russian Far East. North Korea had been sending laborers to Russia since 1947. In what looks like a win-win arrangement for both parties, North Koreans find a source of income abroad, while Russian enterprises benefit from cheap labor. The workers give up to 70 percent of their monthly salaries (about $100) to the North Korean government. They are also supervised by North Korean government officials, who try to make sure that no laborer escapes. In the near future those who break the law in North Korea will also have it tough in Russia. During his official visit to North Korea in November 2015, Russian Justice Minister Alexander Konovalov signed a bilateral agreement on “mutual legal assistance in criminal cases." The Russian Justice Ministry told Kommersant that the document has still not entered into force, but it is about to be ratified. The agreement will make it easier for North Korean special services to look for fugitives from the country in Russia. Of course, the Russian authorities need to be informed about such searches. Georgy Kunadze, who was Russia’s ambassador to South Korea in 1993-97, says the agreement will worsen the situation for North Korean citizens seeking asylum in Russia.